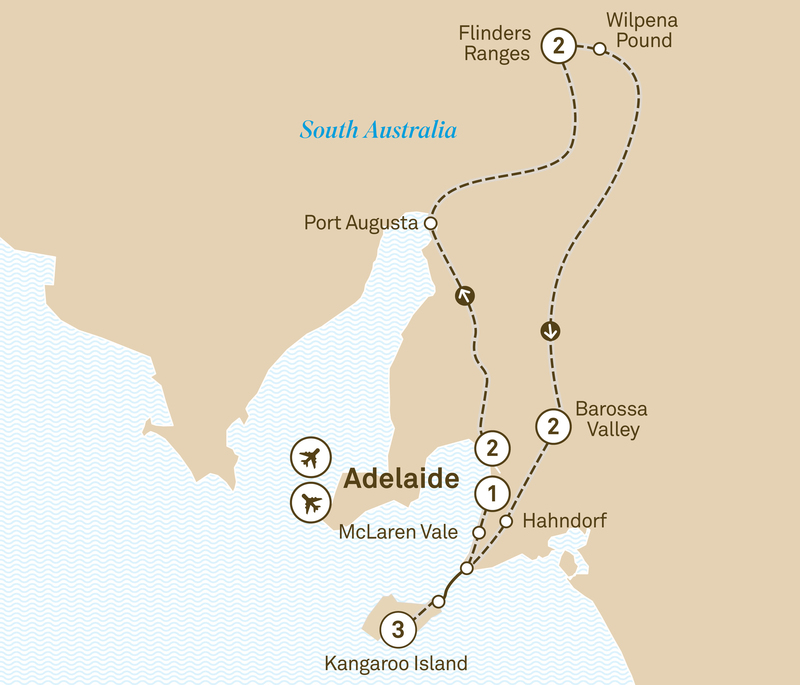 Discover the beauty of South Australia with an 11 day tour from Adelaide. Delight in the Clare and Barossa Valley and visit the beautiful Kangaroo Island. Celebrate the diverse range of flavours, culture, wildlife and landscapes on offer as you explore this beautiful state. With lush green valleys, rugged ancient plains, cosmopolitan cityscapes and wide stretches of incredible coastline, South Australia is a revelation. After sampling the refined elegance of Adelaide, venture back in time to the 540 million-year-old Wilpena Pound landscape. The sheer magnitude of this extraordinary place will stay with you forever. The delights of the world-class Clare and Barossa Valley wine regions await as you sample the finest reds and whites and discover the intricacies of wine-making. The wonders keep coming when you arrive on Kangaroo Island. Cheese, honey and even more wine can be found here, along with an incredible collection of wildlife – sea lions and little penguin colonies, migrating whales and rare bird life, wallabies, echidnas and plenty of kangaroos and koalas. Welcome to Adelaide, South Australia’s capital, renowned for its gourmet delights and thriving culture. Transfer to your hotel, your home for the next two nights, and enjoy a welcome dinner to celebrate the wonders of South Australia. Discover Adelaide’s history and culture on a guided walk or taste your way through the Adelaide Central Markets. Alternatively, take an Adelaide city sights tour which includes the newly renovated Adelaide Oval or a Torrens River cruise with a visit to the Adelaide Zoo. Travelling north, stop in Port Augusta, situated on the quiet waterways of the Spencer Gulf. Visit the Wadlata Outback Centre and travel through the ‘Tunnel of Time’ to learn about life in the outback. Journey into the beautiful Flinders Ranges National Park and your hotel for the next two nights. Watch the sunset, drink in hand, from Stokes Hill, which offers spectacular panoramic views of Wilpena Pound and the surrounding ranges. Optional luxury camp stay - Choose to upgrade to an Ikara Safari Tent. (Additional expense, must be pre-booked). With rugged mountain scenery, peaceful gorges and a huge array of wildlife and flora, the Flinders Ranges is a wonderful showcase of the Australian outback. Optional flight - Optional flight over Wilpena Pound available today. (Additional expense). In a 4WD, venture with your local guide to Wilpena Pound. Hear stories about this natural amphitheatre, used as ‘The Meeting Place’ by the Adnyamathanha people for tens of thousands of years, then as a natural lifestock enclosure by early pastoralists. Explore the picturesque Clare Valley, one of the oldest wine regions in Australia and home to an emerging food scene. Between the wine regions of Clare and the Barossa, you’ll visit Kapunda, a town with a rich and interesting history. Enjoy the panoramic views from your accommodation in the Barossa Valley for the next two nights. Spend the day discovering the Barossa Valley’s famous drops. Enjoy Lunch at the award winning Jacob’s Creek Winery followed by a vineyard tour. In the afternoon, appreciate the chance to try wine from the year of your birth at Seppeltsfield. Visit the lovely town of Hahndorf, settled by German immigrants, where their influence is still visible. While exploring the town, why not try the local apple strudel made to a traditional German recipe. Continue to Cape Jervis, where you’ll board the ferry for Kangaroo Island and make your way to Kingscote on the south side of the island to your accommodation for the next three nights. Optional lodge stay - Optional upgrade to the award-winning Southern Ocean lodge. This will substitute accommodation and touring activities. (Additional expense, must be booked before departure). Be inspired by the scenery at Flinders Chase National Park. Admiral’s Arch and Remarkable Rocks are great photo opportunities. A special encounter awaits at Seal Bay, home to the third largest sea lion colony in Australia, where you’ll meet your conservation guide for a walk amongst the seals. If you are quiet you might even hear them talking. Tantalise your taste buds as your epicurean guide introduces you to the magnificent tastes of Kangaroo Island. Return by ferry to the mainland and head via McLaren Vale to Glenelg, a beachside suburb of Adelaide, where you will enjoy a Special Stay. Reflect on your adventures over a farewell dinner. It’s time to say goodbye to your new-found friends and the delightful tastes of South Australia.